I hope everyone is starting to enjoy their summers out there in collector land. 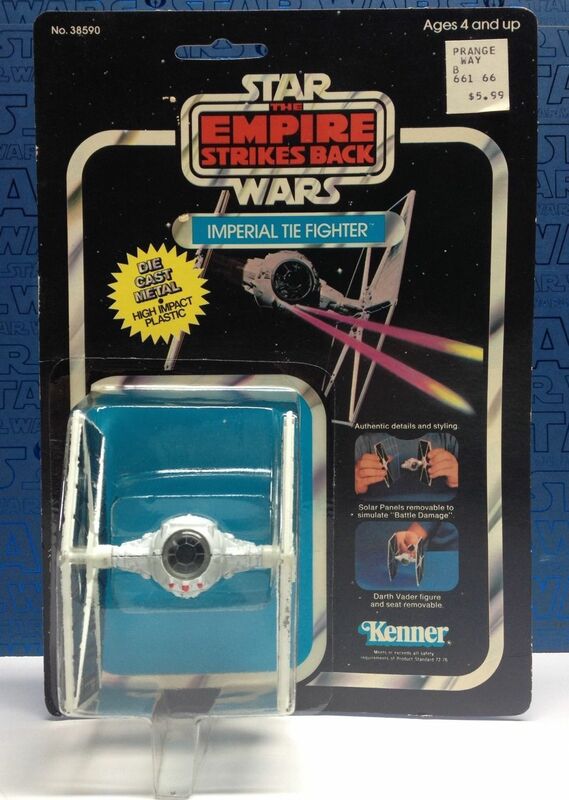 As usual we’ve seen a big uptick in auctions and the summer boom is in full swing on eBay, RebelScum and the Imperial Gunnery. This month we bring you another round of big auctions from the past few weeks, with some rare, not so rare and readily available items with some interesting ending price results. It’s a bit heavier then others as I feel bad as we’re book-ending this with two more editorial style updates focused on the reality of prices, trends and some new staple behaviors in the realm of Vintage Star Wars collecting. For the Seal Show this month we only have a few items to review. 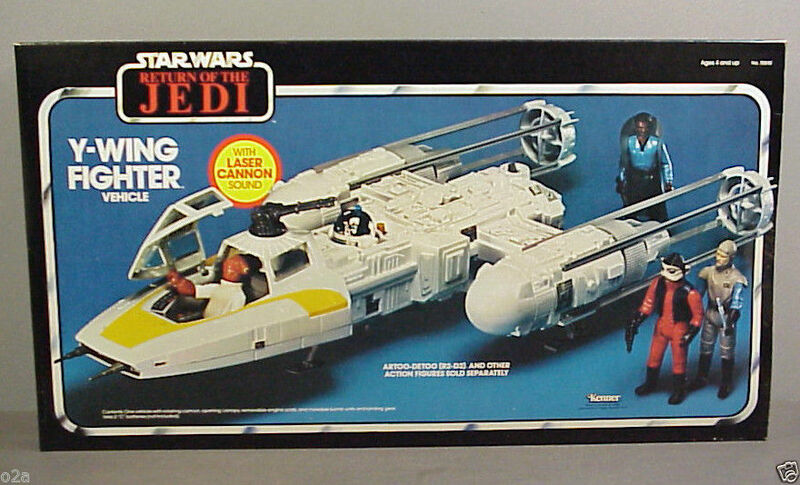 One of the more notable ones being the Y-Wing which we’ve never had the pleasure to feature before. 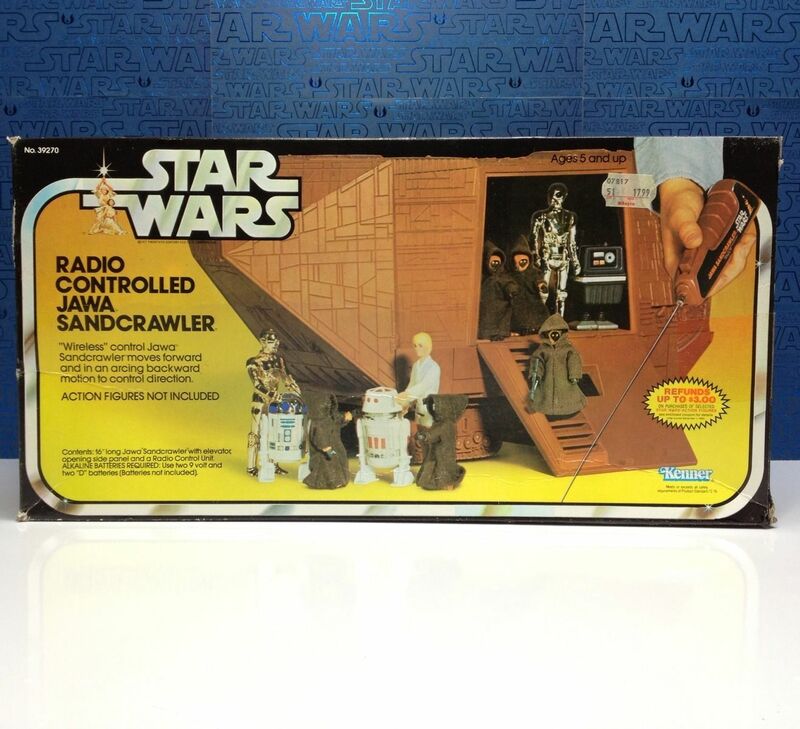 Why you may ask, well simply put this is one of the toughest vehicles to find sealed that isn’t in the coveted super rare category with items such as the Cantina Adventure set and the Sandcrawler. With only a dozen or so graded examples out there you don’t see a sealed version come along very often, and certainly not in the condition which is near perfect in comparison to others that have sold over the past few years. 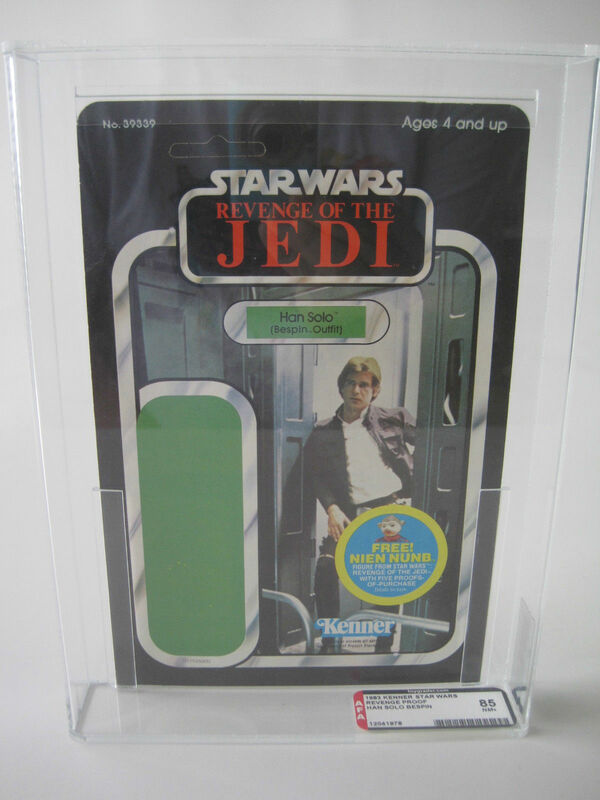 With what would appear to be a hefty price tag for an ROTJ vehicle this piece is right on the money as C7 versions have sold for $5-600 consistently over the past two years, with this one being the best in at least 5+ years. 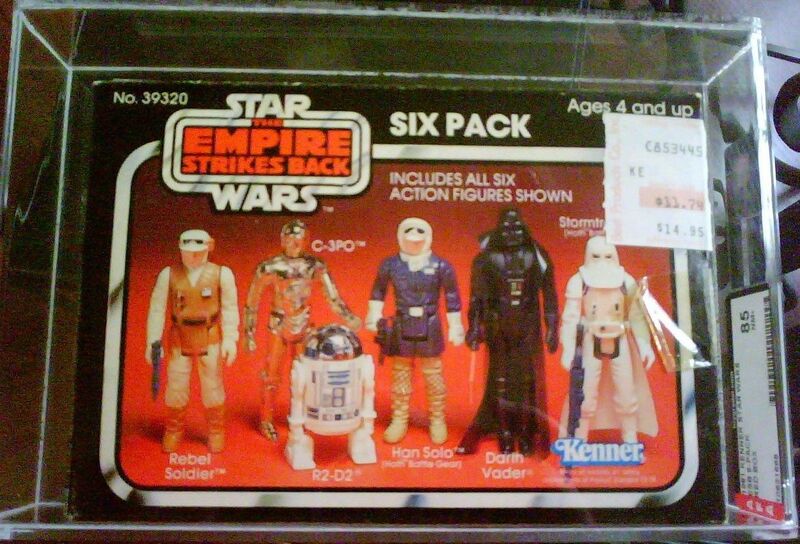 Moving onto our second sealed auction we have a great example of one of the ESB 6 packs, and in this case the rarer of the two, that being the Red 6 Pack. We’ve seen these come up in the past and know that they are outnumbered by roughly 10-1 by the Yellow 6 Packs, thus making it much rarer and in all cases demanding a premium in comparison to the Yellow six pack. This one is particularly nice getting an AFA85 with a price that is out of this world at $7100. This is way above the average price seen and might have been driven up by the extra exposure the item had by being listed with the Yellow 6 pack at the same time. Although we only had a few items to cover in the Seal Show that doesn’t carry over to our usually sparse coverage of loose items in Open to the Public. In fact this month we focus heavily on all things out of the package. The Vlix is right, is a saying heard many a times on the Vintage Pod, but in this case I’m not sure if the price on this Vlix is right. 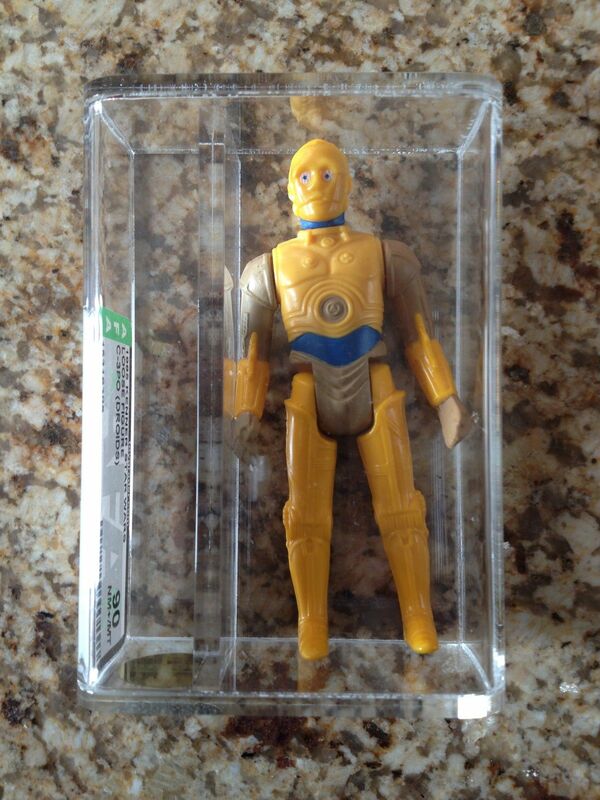 What would you pay for an incomplete action figure? Well a few years back the head (just the head) of a vintage Stretch Lizard (from the original Stretch Armstrong Line) sold for nearly $1000 on eBay. Here we have a full figure just missing the weapon. Although the NG grade was ultimately given due to the missing weapon, it’s still a strange way to treat what something that really doesn’t deserve a grade period. For the remainder of Open to the Public we have four staples from the original toy lines which are today regarded as some of the most coveted of the loose figures to be released. Four staples of the hobby that all saw great prices realized given they aren’t really rare but the demand is consistently high, given the relative sparseness of availability of the items. 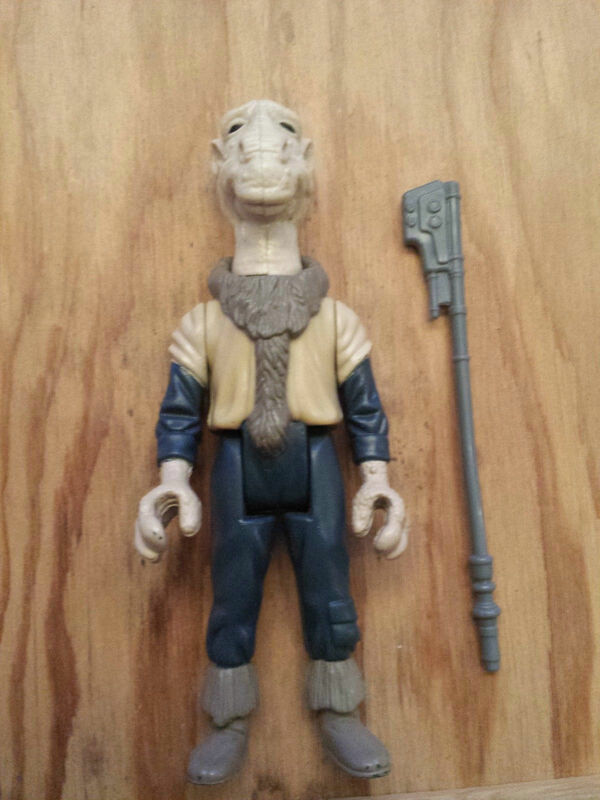 First off we have a standard loose Yak Face, seeing a price of $270. This shows just how hot the market is these days given that a loose Yak Face would go for roughly $150 consistently in the last few years. 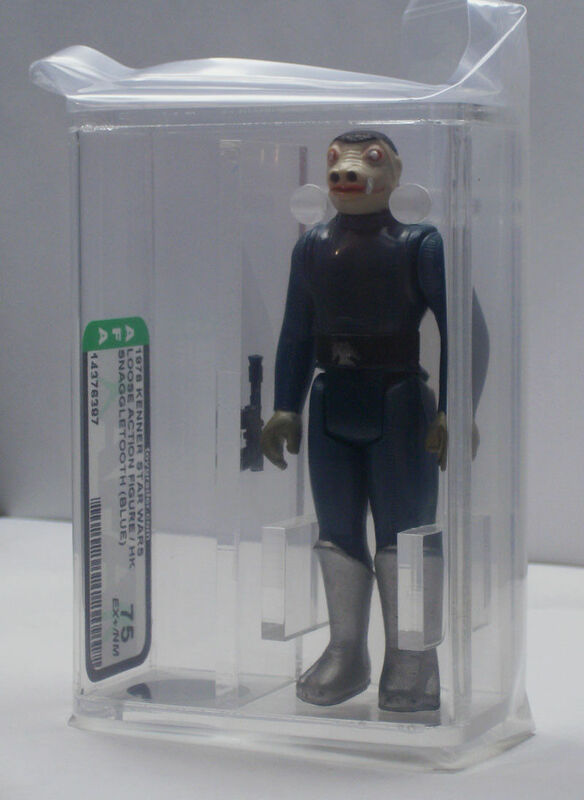 Running down the line we have Blue Snaggletooth, in good condition graded AFA75. 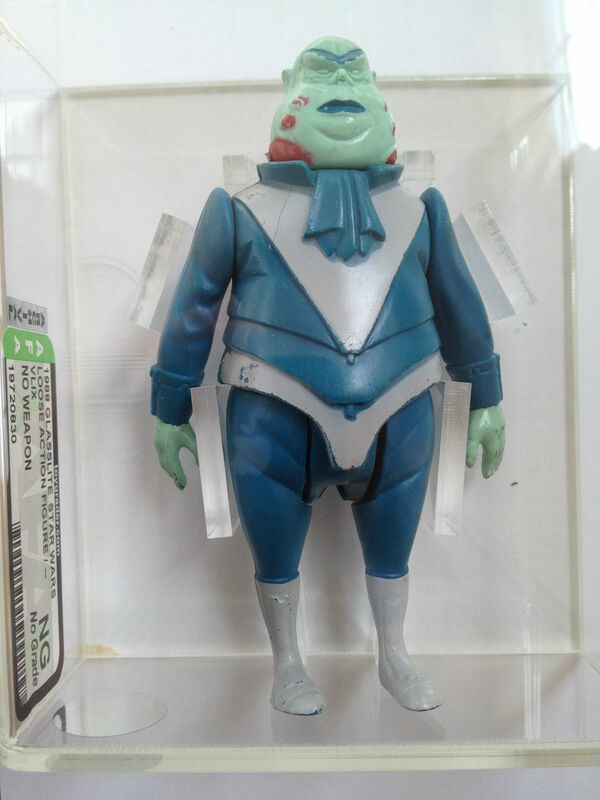 Loose AFA figures have been really hot over the past few years, and with the rarer figures like Blue Snaggletooth we see consistently high prices even with items that are not in the best condition. Finishing off the section we have two higher grade items that support the previous thoughts on AFA figures and their value today. 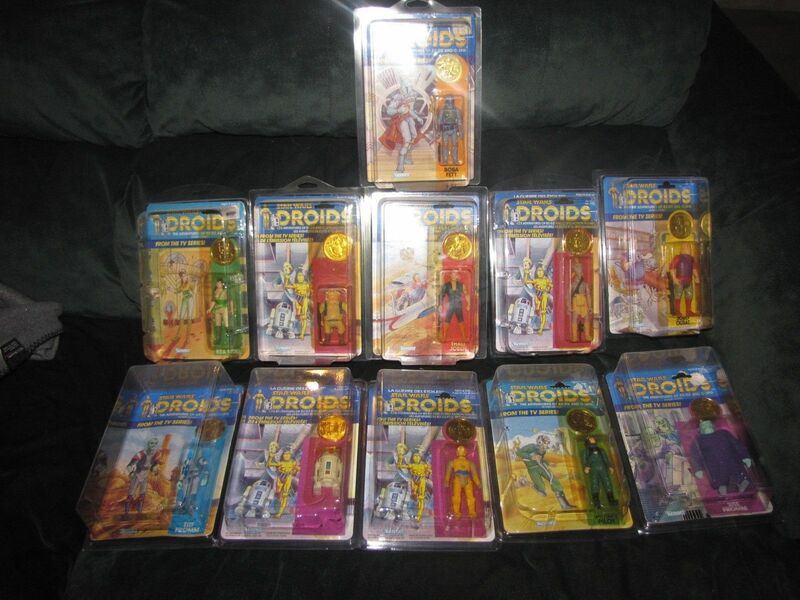 However these are on the other side of the condition sphere as we have an 85 and 90 of the two most popular figures from the Droids line seeing prices of $250 and $300 respectively. Both figures in 85 condition consistently go for $150-200 each, so seeing these prices is pretty impressive. First off we have a great variant for all of you extra sweaty nerds that can’t just be happy with a Lili Ledy removable hood. 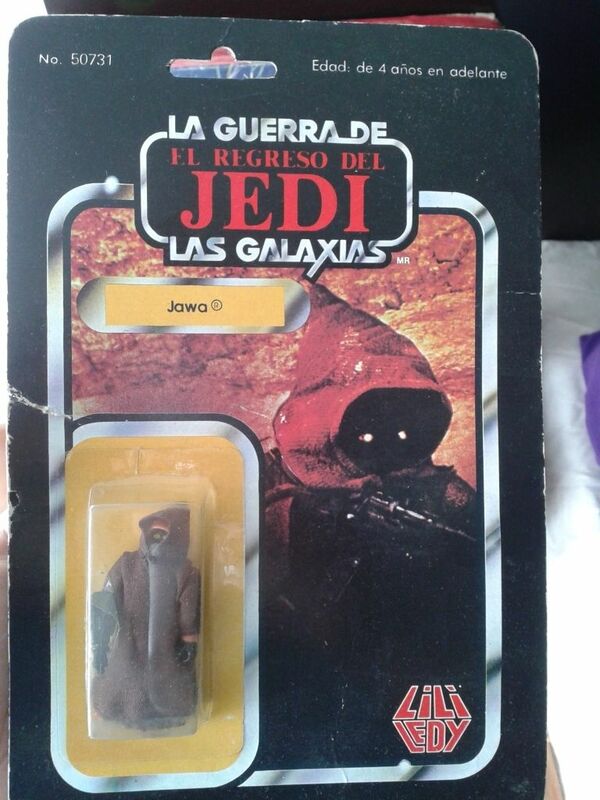 Here we have the Lili Ledy Jawa with a dark thread stitch, with only a handful in circulation this is one of the holy grails for Jawa colletors and variant collectors alike. This particular saw quite a premium vs. one that sold earlier this year for around $1700, given the time of year it’s expected to see an increase in price, but with a 36% it’s a bit out of the norm. Whenever we have a chance to highlight a Meccano piece I’m always delighted. The figures are so unique in that they take a lot of the elements of US carded figures and give it a slight spin and with Meccano I don’t know why, but the square cardbacks always intrigue me. 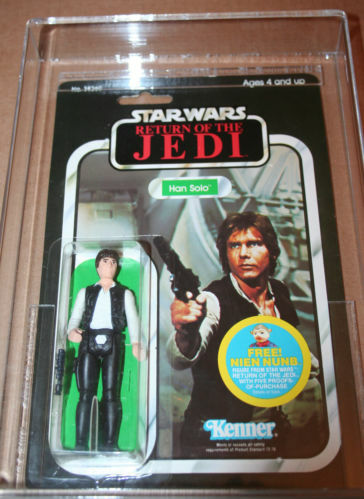 This particular piece is of one of many collectors favorite figures given that it’s considered by many to be the best molding of a Han Solo figure. That coupled with the fact that it’s in good condition made this piece jump to the price of $3050 a very nice find and an awesome price. If you’re sick of me covering Mailer sets please let me know, until I get a lot of complaints I’m going to continue to showcase this niche line of items in the hobby. 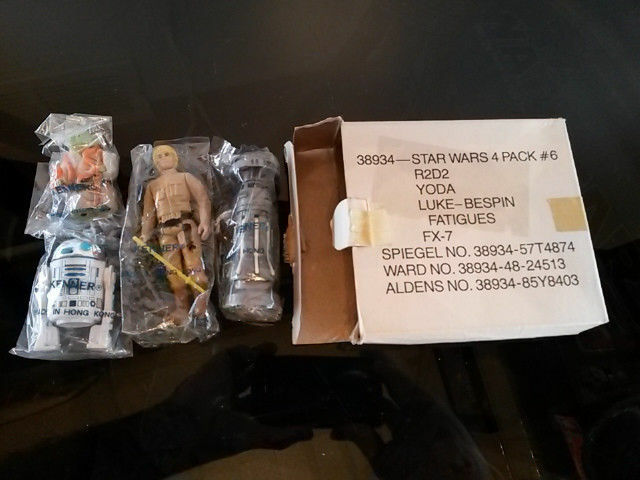 This particular set is the holy grail of Mailer sets, the 15 pack Lineart ESB set graded AFA85. It’s so impressive to see these items graded, and one of the few types of collectibles that I think is completely enhanced by the grading process as displaying these is not only difficult without a case, I’ve just never really seen a good way to showcase them period. 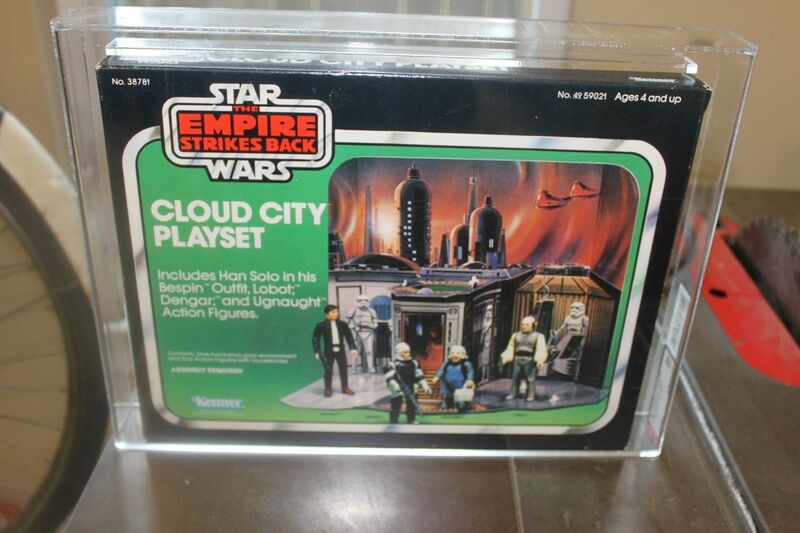 This set is such a great item and so epic in appearance, with a price tag of nearly $4500 it has to be one of the most expensive mailer sets to ever hit eBay. I won’t spend too much time on this piece given it’s been talked about on the Rebelscum boards in a separate thread. 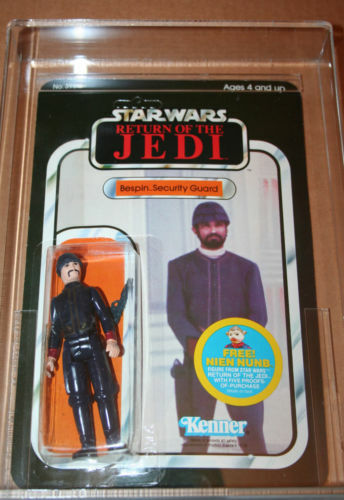 However I would be hard pressed to not cover a $50K auction for a vintage Zeb Kellock. 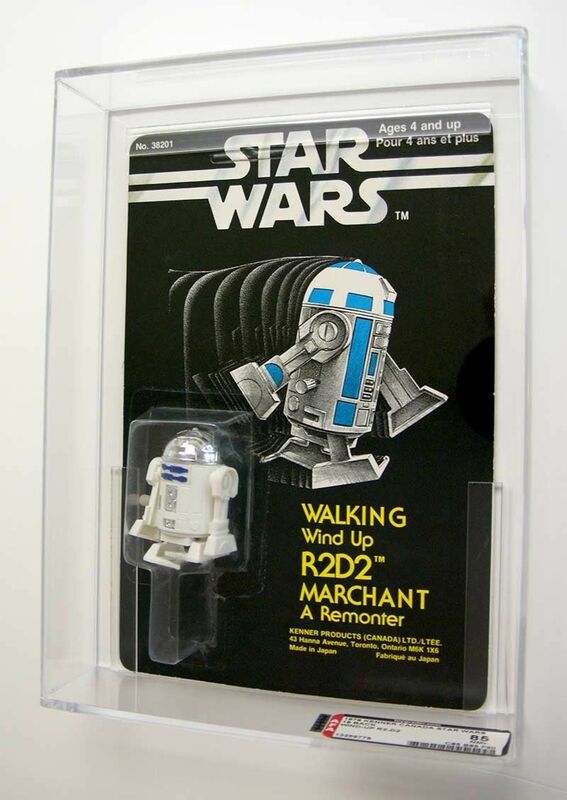 Not only would finding a loose version of this be cool given the detail and high desirability of the 2nd generation of Droids and Ewok figures, here we have a carded figure from the line. 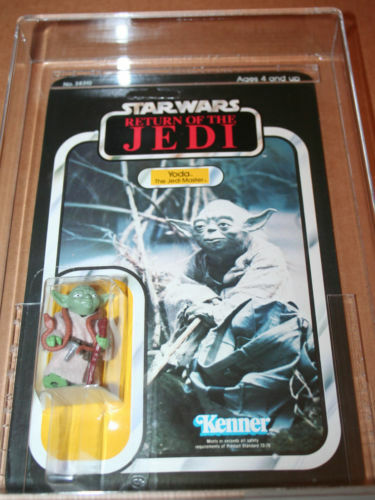 In line with some of the Toy Fair samples of carded POTF figure that weren’t released this has to be one of the best preproduction items to hit eBay in recent history. That wraps up our update for this month, check back next month for our normal Monthly Updates for August, and later this month for the second installment of the editorial style “This is Reality, Please Come Back to It” where we cover, Boba Fett, Darth Vader, High Grade AFA and an added section abandoned auctions the new ultra evil in collecting. This month on the MarketWatch Monthly we have a general update of the market and some of the more notable items that have been up in the market in the February/March timeframe. This month on the Seal Show we have a diverse offering of toys from Electronic games, to staples of the vintage line, to off shoots from the core line of toys and all points in between. This is a bit of a hodge podge this month, but I hope you enjoy some of the unique items we found on the market. 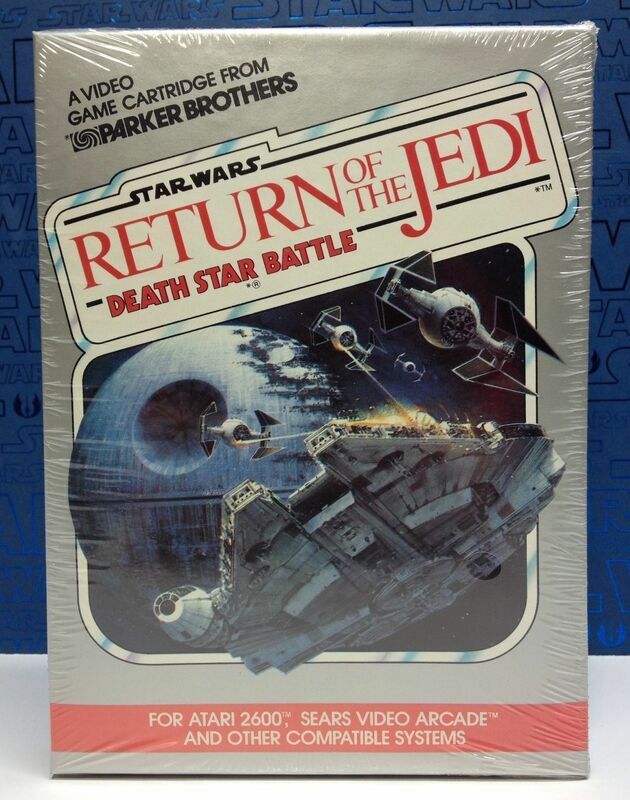 Our first auction is an interesting piece to feature, the original Atari Return of the Jedi cartridge MISB. We never really cover these as part of the Vintage line, but I’m officially taking these back and incorporating them into the Vintage lineage going forward, as really this is the evolution of Toys into the digital world. Our second items come as a pair, as they are a quick showcase of two really great items that ended a few weeks back. Another part of Rebel Scum Emporiums auctions from Q1 these were some of the last auctions to get picked up. 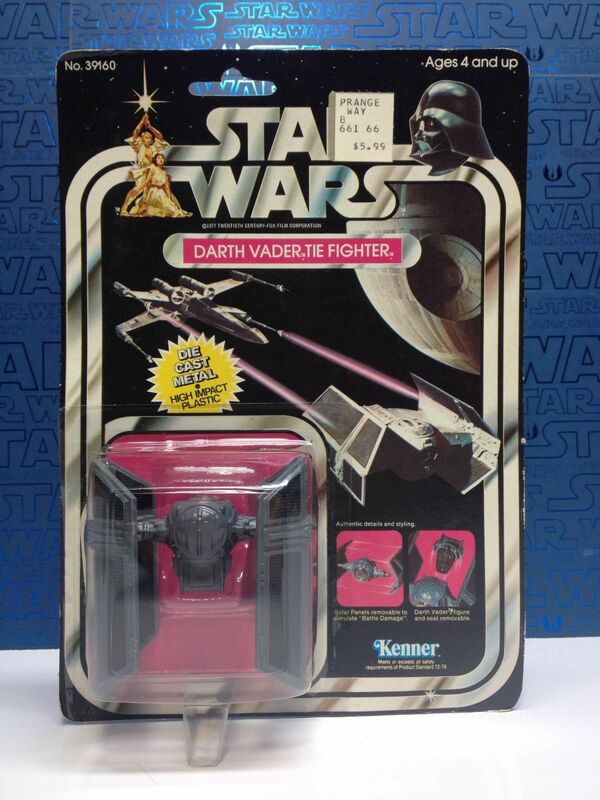 The key piece to mention here is the ESB Tie Fighter, definitely one of the more difficult to find pieces especially in the condition we find it in here. Moving on down the line we have two great staples of the hobby, the CS version of the Landspeeder and the original SW Millennium Falcon. 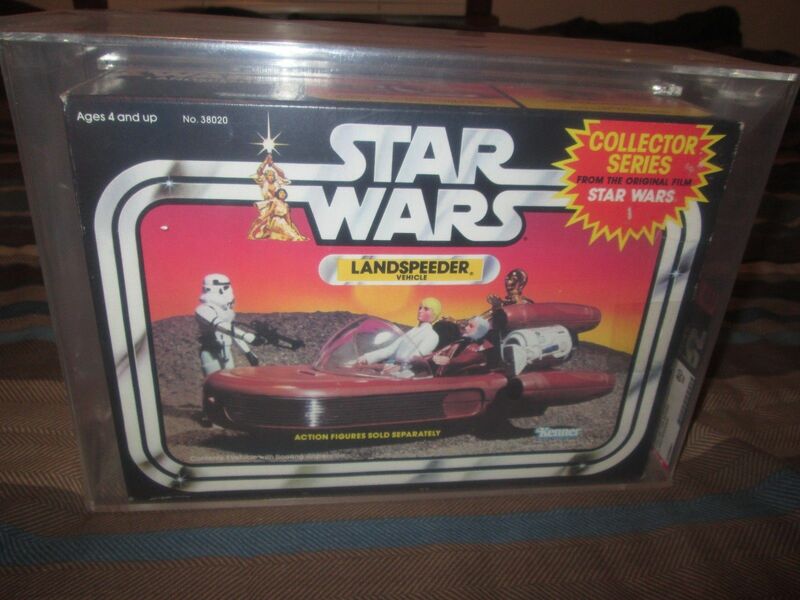 The SW Landspeeder is such a great toy and one of the most recognizable in the line. We saw a good showing on price here as that $300 price tag is right on for an AFA80, worth mentioning once in a while I’m sure we’ll see this piece again on the MW in the coming year. Coming off a full update on the loose side of the hobby, we have a very focused update for March with only two auctions getting call outs. Our first comes off the heels of the Lili Ledy featured items last month. 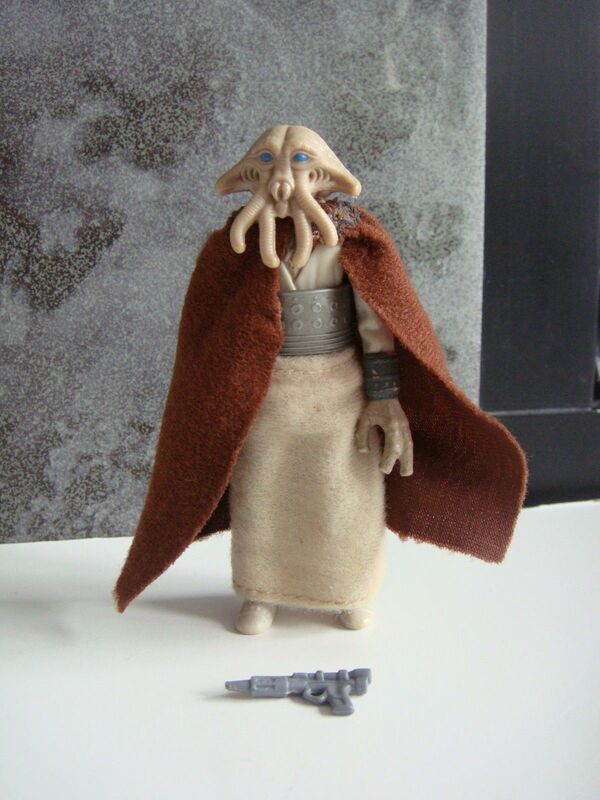 Given that we were able to feature four of the five extremely popular Lili Ledy Variants, I wanted to showcase the fifth, that being the super rare Red Cloak Bib Fortuna. This piece has always had a special place in US collectors hearts, as it’s featured in a number of photo samples and even in some production photos, bringing up the question, why didn’t we get the red cape Bib in the states? Although I can’t speculate on why this occurred, I would venture a guess that between the SWCA.com and Rebel Scum you should be able to do your own research on this piece. 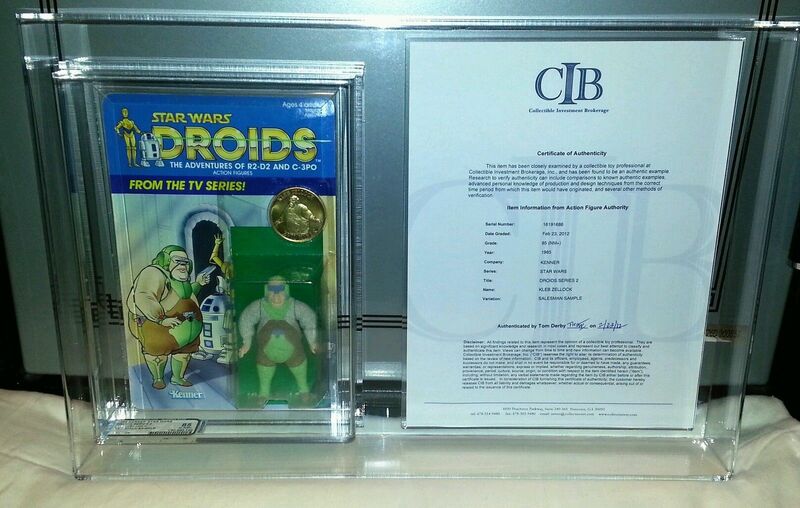 This particular item is graded with a COA from Tom Derby, the retail is a bit high from where I’ve seen these land in the last few years, but still in line with FMV. 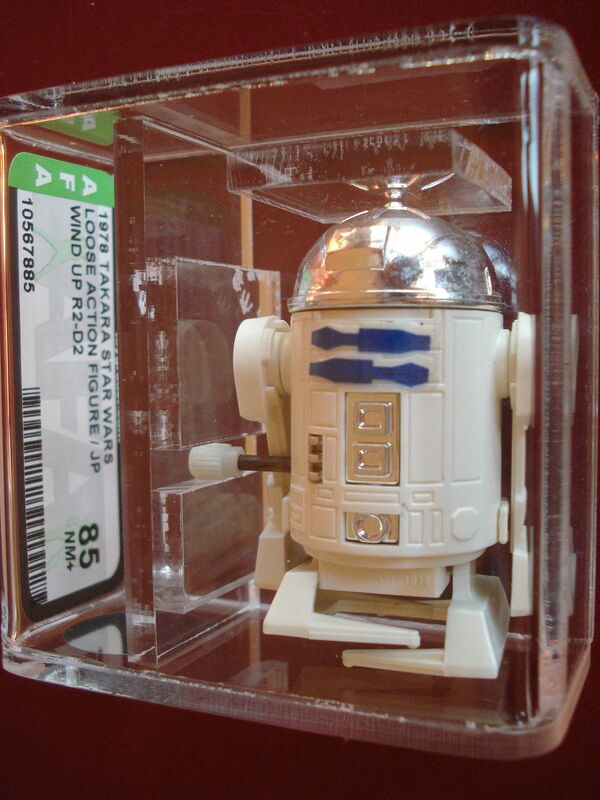 Following up to our Lili Ledy figure we have another great foreign company example the walking R2D2 from Takara. 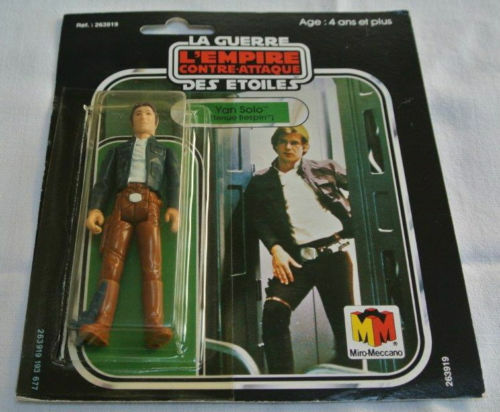 Know not only for the Star Wars line Takara is one of the biggest toy producers in the Eastern Hemisphere with hundreds of great lines produced over the years. Here we have a graded version of the figure receiving an AFA85 overall and a strong price point of $310. This month there are three specific auctions I wanted to highlight. This showcases some of the most unique and most difficult items to find in the hobby. From a 12” prototype, to a Canadian rarity these are a few of the most unique items show up on the market in the last month. 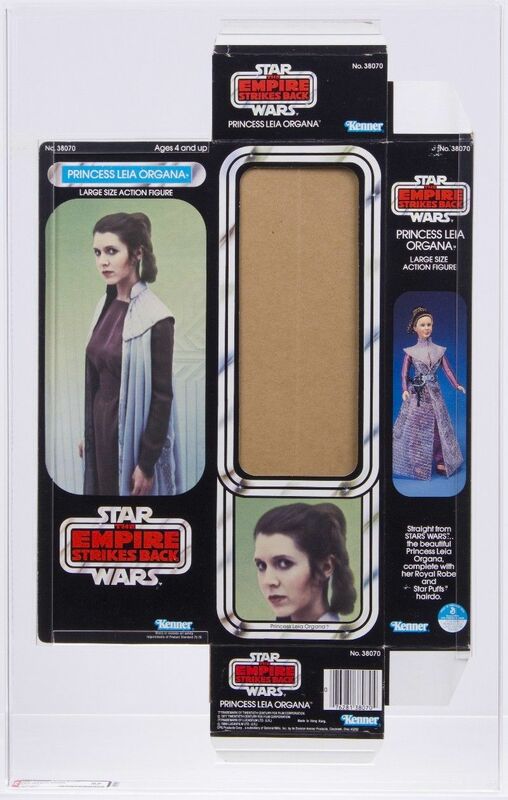 One of the, if not the most sought after item in the 12” Series is the Leia Bespin Figure or for that matter any of the new figures from ESB Large Format release. 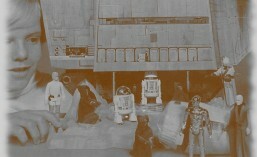 With only IG-88 making it shelves all we have of the other items is preproduction and mock ups. 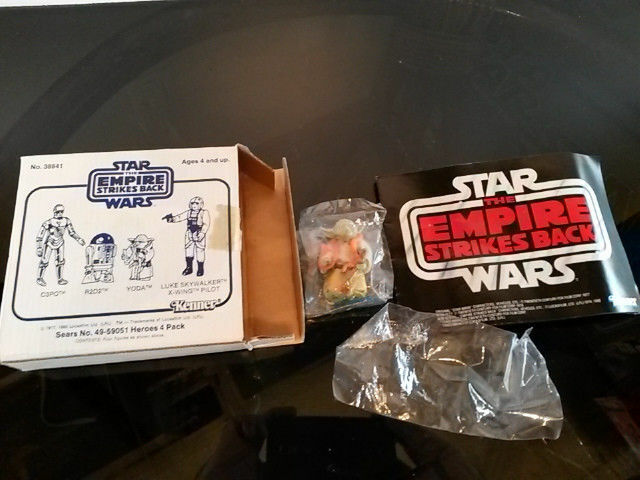 Here we have the box for Leia Bespin, the boxes were truly incredible when it came to the 12” line. With more images and scenes then their 3” counterparts they made the line more exciting and visually stimulating. This particular piece was graded with an overall grade of AFA85. A truly unique item for only the high end collector, it should be noted the price came down from the original listing by $4000. 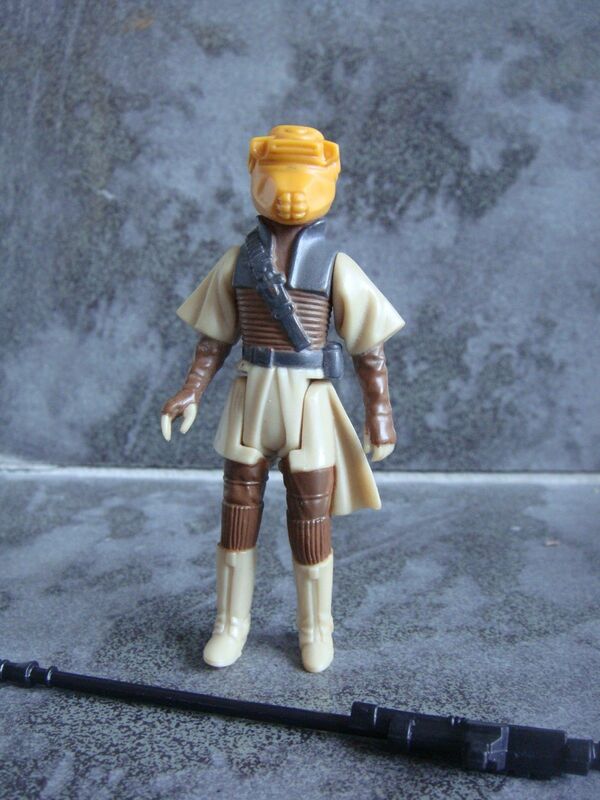 Along with Yak Face, the MOC Anakin figure is the only other truly rare MOC from the last 17 release. 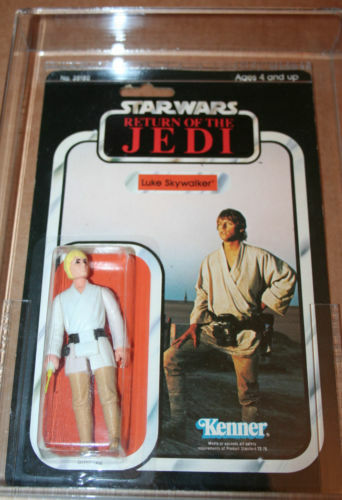 With no circulation in the US and most countries abroad, the Anakin figure was released exclusively in Australia. Thus they are few and far between in terms of availability and especially in good condition. 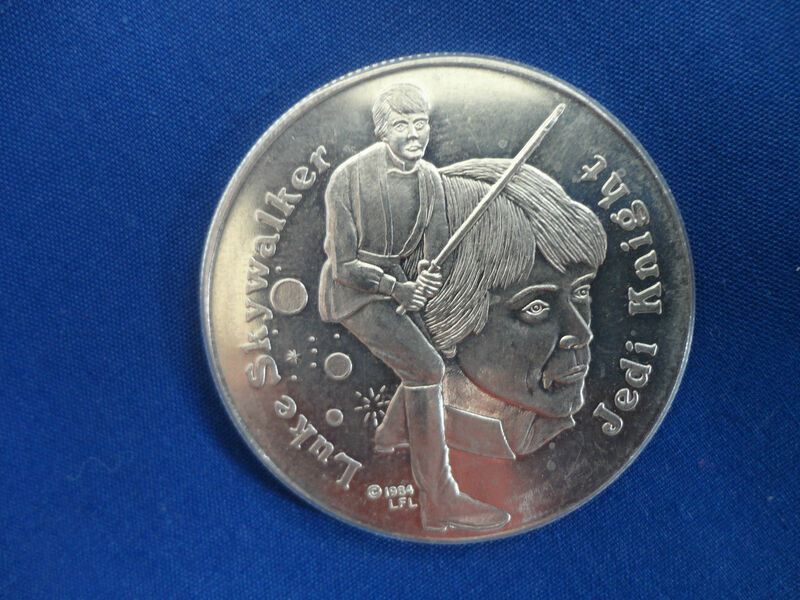 Want to turn that up a notch, try finding a clear bubble Anakin Skywalker – only 6 exist in the AFA database and most have turned yellow since. 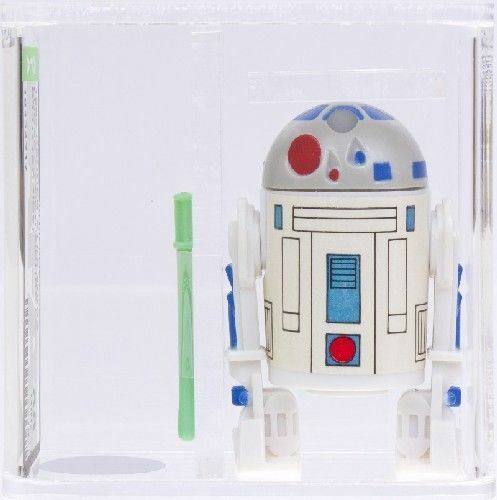 The Wind-Up R2-D2 is truly unique and another take on everyone’s garbage can shaped droid. With the majority of these coming overseas from Takara, find a Canadian version is quite rare and as one can see very expensive. With an overall grade of 85 the price tag is fitting for the R2-D2 focus collector that already has everything R2 already, in fact a certain collector comes to mind when I see this piece in particular, oh let’s say someone with a round room painted like R2… Anyway a cool piece in great condition at for a boat load of cash is definitely worth mentioning. That brings us to the end of the March MarketWatch Update. Next month we’ll have our regular update in a shortened fashion along with an important article on pricing called “This is reality – please come back to it”. A segment that will focus on the average values amongst different categories of items on the market today. Call it a baseline, but it’s really just meant to bring us all to the same page in terms of what true fair market values look like in 2014. 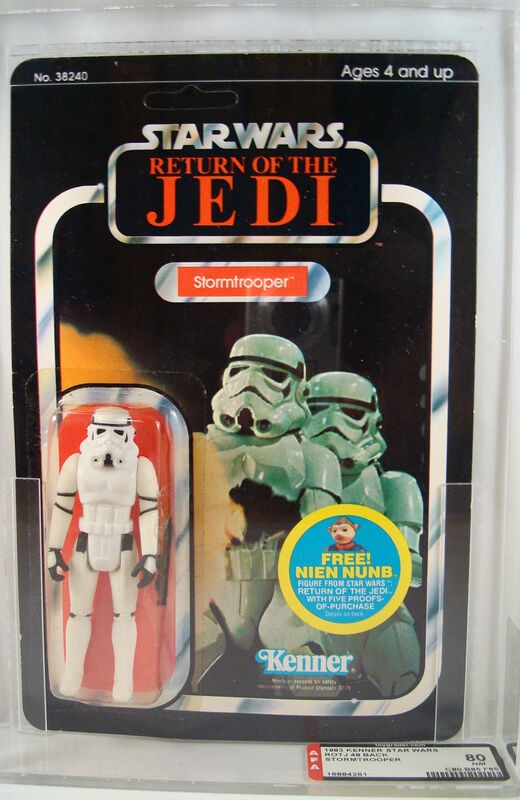 I wanted to give you a write up on a transaction that is really one of the highlights of vintage Star Wars collecting in recent history. That transaction being the large scale sale of 130 figures on the Travel Channel Show Toy Hunters on February 19th 2014. Jordan the proprietor of the shop, site and all things Hollywood Heroes is an avid collector who has been able to turn his hobby into a retail career, and now a full length show with nearly three years under its belt. 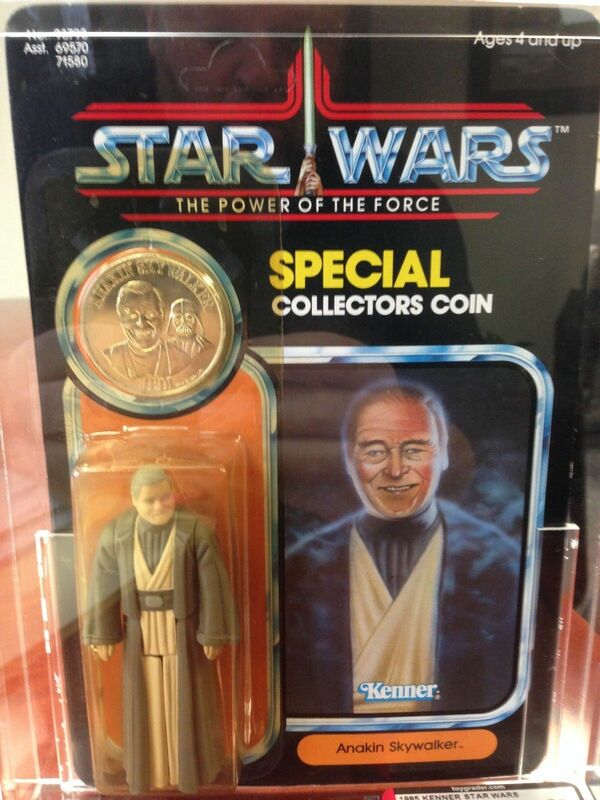 Luckily for vintage collectors there’s plenty of Star Wars and other similar lines featured on the show. The deals are interesting to see go down and the breadth of lines represented is pretty impressive. 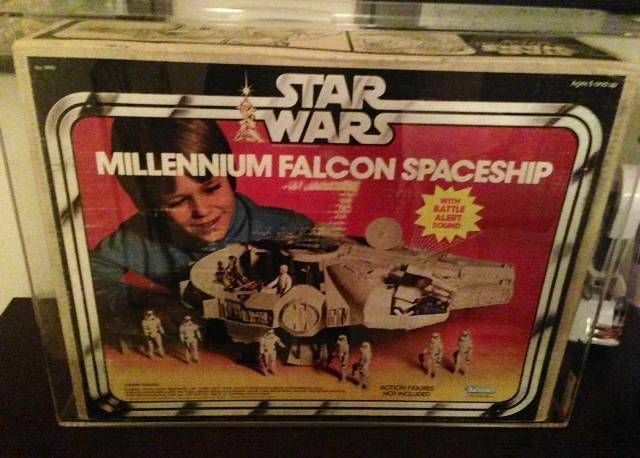 Recently we saw what is one of the greatest mother load finds in the history of Vintage Star Wars given its size and scope. 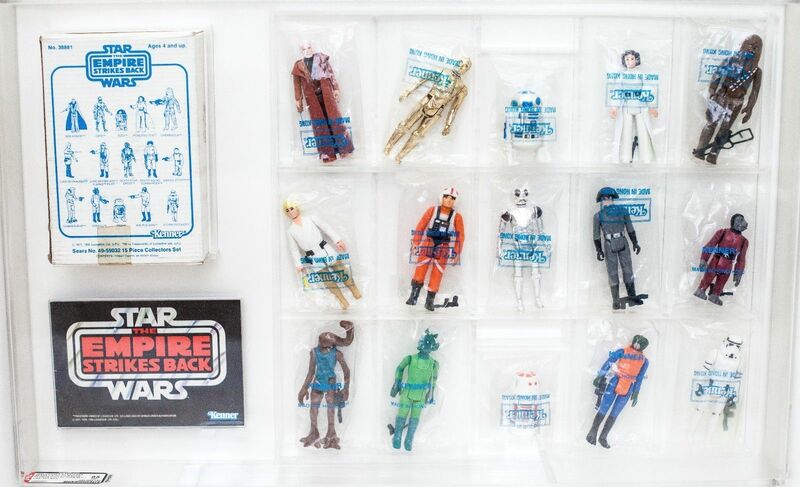 Included in the set were 130 vintage mint on card figures, spanning all three movies. 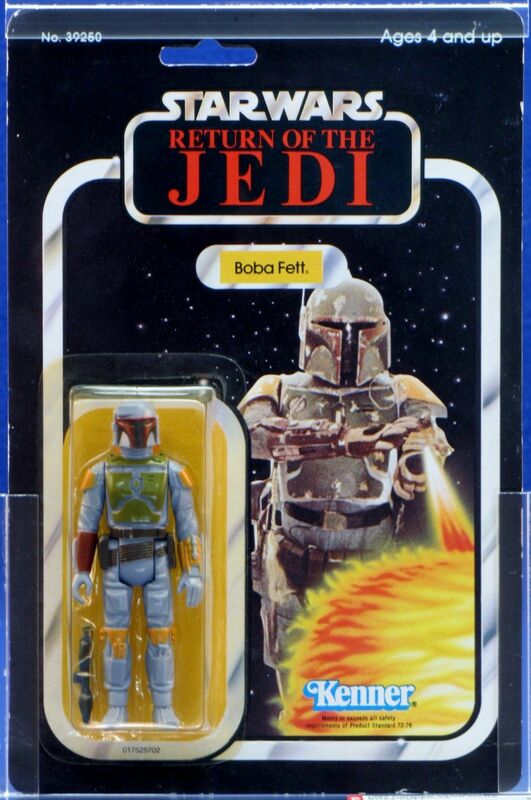 The heart of the set was a Boba Fett ESB figure, 2 Sets of 12 Backs and several other high grade SW, ESB and ROTJ figures. Jordan paid a couple that had held onto these for several years $15,000 for the set of figures, which has been the center of some controversy with the deal. Given the span and value of the collection I wanted to take some time and review the transaction and discuss some perspectives on the deal itself as it stands on it’s own in the Vintage community and amongst the deals we’ve seen on the show to date. Before I go any further I want to say for the record, Toy Hunters is one of my favorite concepts for a show, and I’ve seen every episode to date. Therefore I have nothing against Jordan, or the show itself as it’s TV and there’s editing and magic that’s done to make the show work. Thus I don’t have any issues with the staging aspect of the show as that’s how all reality TV is done these days. However I do feel it’s in both his direct and the overall networks responsibility to be accurate with what is shown (pricing and condition wise) and not to disparage from the fair market value (FMV) of items that are shown and directly priced on the show. I wanted to talk about the deal specifically, most specifically the purchasing side of the large collection as opposed to the sale of the 15 MOC figures for $25,000. But for sake of giving a few quick background points I did want to touch on it with a few thoughts. 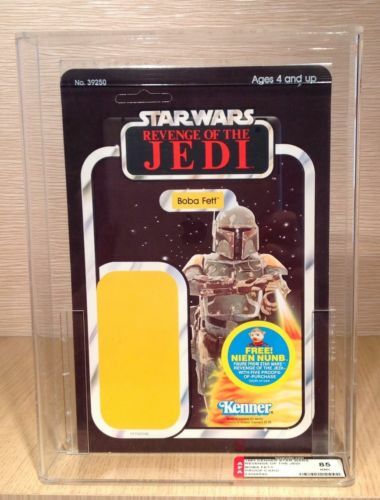 These sets aren’t apples to apples with what we saw on Toy Hunter, but they give us a realistic view of what a single auction can bring in terms of price for a set of the original 12. I did some digging on the other 3 figures in the purchase as well as what putting a set of 12 backs together has run on average over the past year, and came up with the numbers below as a 2nd reference point for value. 12 Back AFA 85 Set – Average Price = $12,400, with it costing more to put together a set piece by piece as opposed to a single purchase of 12. Ultimately people are going to pay a premium for having someone come to their place (boat in this case) and hand deliver a high grade set figures. I don’t doubt there needing to be a premium at all as it’s a different situation from what most collectors deal with. The figures that received 90’s that were included in the set are 85s at the end of the day from a perception factor. 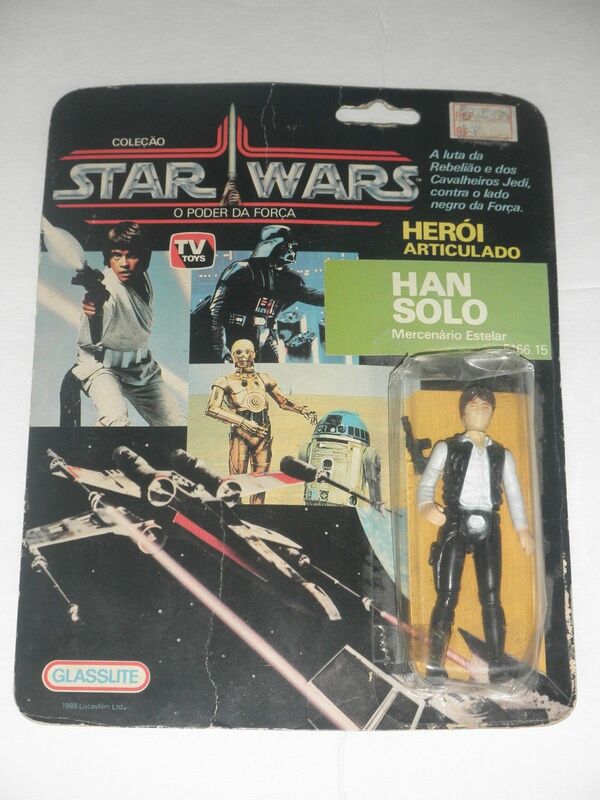 If he could have gotten what he stated he could for them, he should have sold them separately and used the other examples of C-3PO and Chewy that were in the other set of 12 back. Ultimately the 90s don’t drive the value of the “set” that much and he would have benefited from selling those as single figures to a focus collector. If the customer paid what they paid, that’s their fault, as to be honest that deal isn’t really that shady from my perspective. The sale is what it was , and although I think it’s a bad way to acquire a set of figures to each their own. The 130 Figure Purchase – My first challenge. Representation of pricing of the figures both on the front end and the sale. The perceived lack of value in the rest of the figures in the deal that weren’t part of the 12 back sets. If I look at the purchase itself I break it down into components and the value of the components to come up with my challenges on the value of the set vs. what was paid. 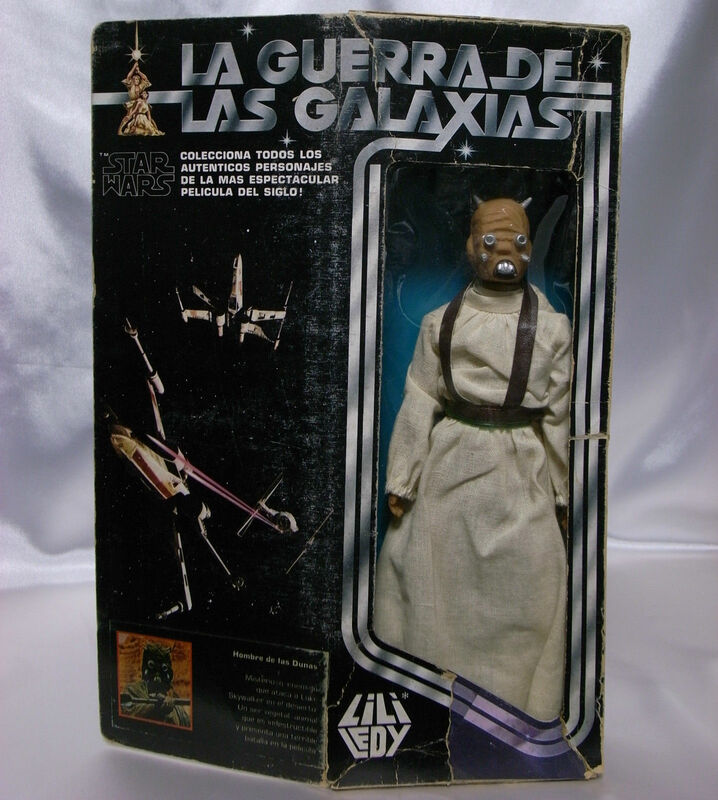 Given that he took $25,000 just for the set of 12 backs + the 3 Cantina figures, if the $15,000 was just for the one set of 12 backs and the three Cantina figures, he would have broken even on that alone. That would have included his travel, lodging, the $1400 AFA bill (Submitting all as archival with S+H), and $5000 grand in his pocket with ease. Thus there’s no underestimating that this was a massive deal for him, and one that paid off big time just in the scope of what we saw sold on camera in the one scene. With $5000 in his pocket on the first part of the breakdown we are going to be talking mainly about the size of the pot enlarging from here on in. Given we have another full set of AFA graded 12 backs we can estimate another $9-10,000 in sales from that set. Assuming he submitted this set as archival he would have rung up another $1150 thus bringing his profit total to $13850 on the high side ($5000+$8850). Given this the profit rate for the sale as a whole is just under 50% which isn’t too far off from where he and other buyers typically try to shoot for when buying toys from individuals. 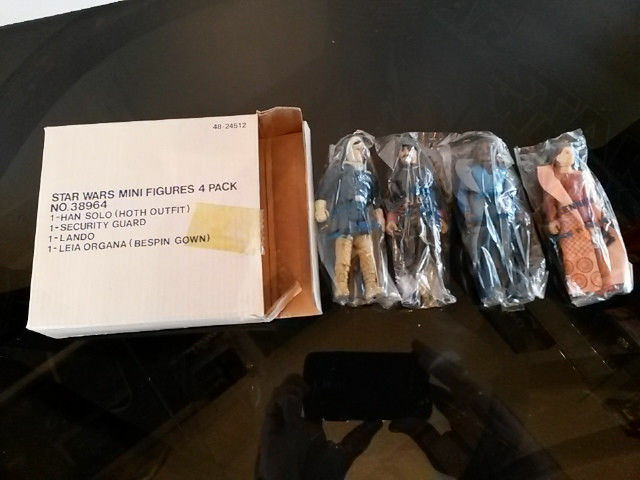 Thus when you look at these 25 figures, what was sold and what we can easily and safely assume the others will sell for you have what can be considered a great and fair find, just amazing unto itself. Oh, but then there’s just the small detail of the 103 OTHER MOC FIGURES THAT COULD EASILY BE WORTH TWICE WHAT THE 12 BACK SETS WERE!!!!!! Okay I calmed down, I just needed to scream for a second there. I understand that the people “did there research” and priced it appropriate to what they thought it was worth. However I do think when you add the other figures into the equation there is no doubting this wasn’t a good score; it was a steal, and it’s not good for the hobby on a grand scale. The perception of value to a large audience is the biggest issue here as it distorts the reality of value of certain items while inflating the values on other items. What was the transaction, i.e. what was the final after they’d received the additional check? What figures on what cardbacks? From there you can get a true read on the situation, i.e. are we talking additional profits of $10,000 or $50,000? 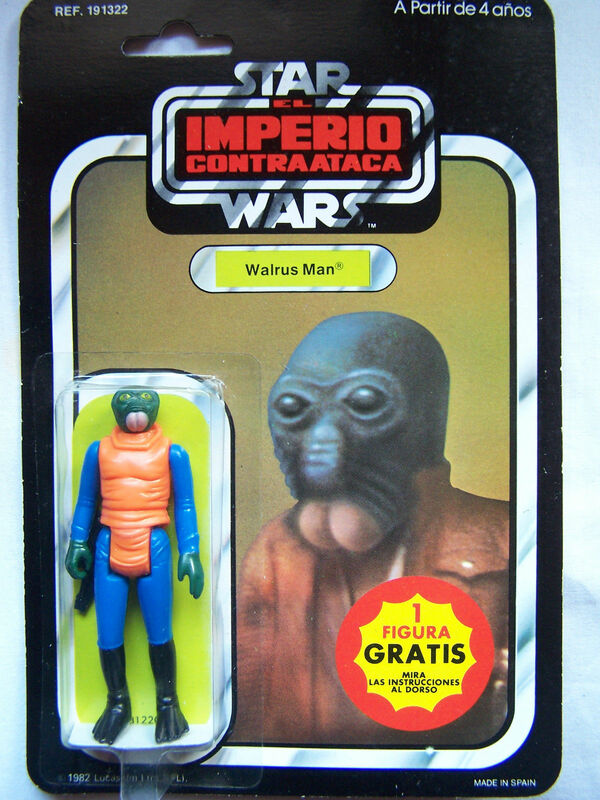 However I doubt that will ever be available, so let’s just go with what we see in terms of other figures, and see if we can come up with a baseline of what the rest of the collection was worth. That gives us a grand total of $9500 which I believe is a conservative estimate on eBay in a no reserve auction. That brings the grand total of what I think they could take away on this is roughly $40,000 not a bad hall for some old toys. It’s quite the profit rate and I will leave you to form your own opinion about that, as I don’t think it would be completely out of line if he sent them more after the fact. At the end of the day there’s nothing legally wrong and morals are different person to person so I won’t argue any points on this part of the deal either and leave up to you to form your own thoughts on the profit side of the equation. Why this is an important topic. Why do I personally think this is an important topic to discuss? Well the first aspect is perception and the other is perception’s direct impact on our hobby. You will hear me say time and time again on the MarketWatch that I don’t think that value is the key reason to collect, and I don’t think most people think of their collections as assets as much as a hobby. However there is an inherent value to what we collect, and it’s important to understand what that value is and to ensure that it’s represented fairly and consistently amongst other collectors. In this case we have a pretty gross case of variance in actual value between what you could get something for; and what you pay for when something is hand delivered to you. What we didn’t get, and is fairly damning to the hobby is an accurate value of any of the other items, and thus the overall perception that they weren’t worth anything. I was once told by a one of the VPs in my company that “Perception is Reality”, although I’ve never agreed with that, I did get the thrust of what he was trying to say. That being that what others perceive to be real is real in their-own minds until proven different. Thus perception is one of the core issues that comes up when I think about the deal itself and the effect it may on the hobby in the short or long run. That averages to be $1520 a figure, thus a bit off from what we saw on the front end of the purchase. Given we’ve already touched on a few comparisons for the 15 figure transaction I won’t rehash those. But here is one name we should remember when we think about this situation, Boba Fett. 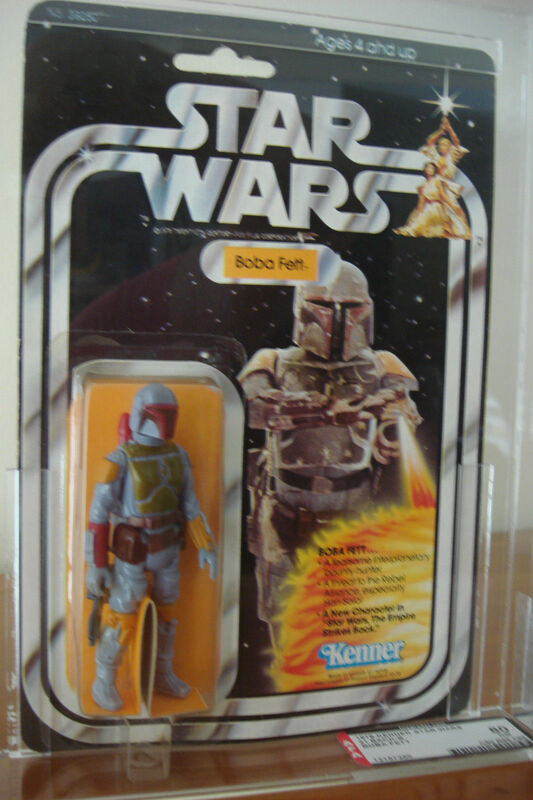 There was a cherry un-punched ESB Boba Fett that was basically dismissed and thrown in with the other non-Star Wars figures. Another strike as it’s probably the most valuable figure (pre-grading) in the lot. 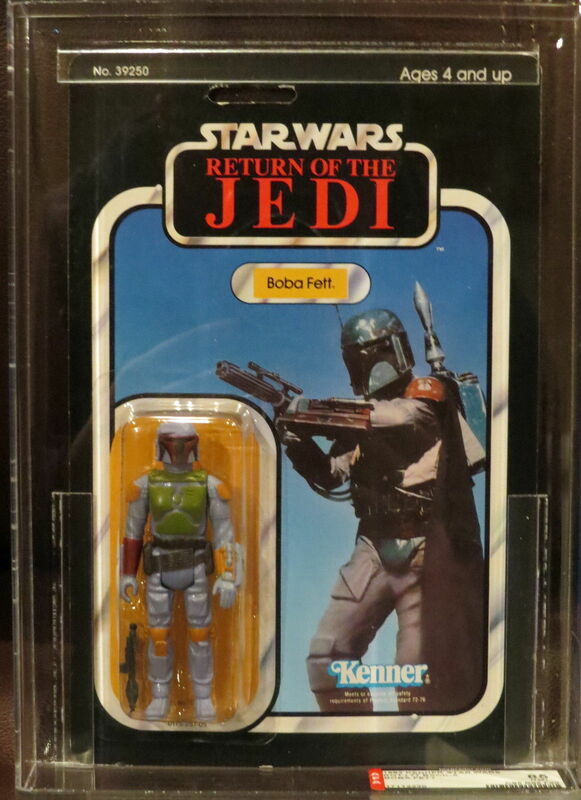 This one just brought up bad memories of the ROTJ Boba Fett on from a few years ago that was listed for $25 when it probably would have pulled $5-650 easily on eBay. If you’re out of touch with eBay which is FMV then fine, but don’t go stating values like their FMV, say this is worth 50% of what I can get at a convention or in my store. There’s a difference between the two avenues, and eBay and boards like Rebel Scum and Imperial Gunnery are much more suitable and realistic medium for transactions in this day and age. Thus we can use these channels as FMV without issue as the community is setting the price. Here lies the core issue on this particular side of the two challenges I had with transaction, and where I have somewhat of a personal issue with the deal. That issue being the fact that they had no problem shooting for the moon with their off the cuff appraisal of the $6500 AFA90 Chewy, the $2500 AFA90 C-3PO, or the Hammerhead, Greedo and Snaggletooth that sold for $5000. All of these were really far off the mark and it shows a crazy disparity in terms of pricing. 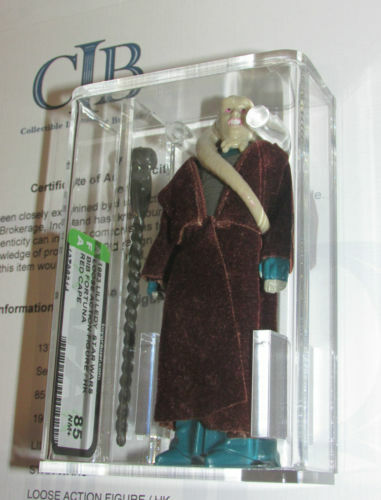 The AFA90s should get a premium, but we’re talking $1500-2500 for Chewy as he brings $800-1000 any month of the year on eBay as an AFA85, on C-3PO similar not too far off at $1500 for an AFA90 as an 85 brings $6-800 consistently. But when it comes to valuing the other items given the overall transaction value, it’s like they have no value, when in fact they were where the majority of the money could have been made. Thus there’s a huge gap between what he’s valuing things at on the front side and where that retail actually ends up at the end of the day. This amplifies the issue of perception more than anything as it shows a disparagement in pricing on a grand level. So in the end inconsistency in price and perception in value are the two challenges I have with a purchase that has caught a lot of attention in the Vintage community. Nothing more from my perspective on the negative side of the equation, as I don’t want that to overshadow the greatness of the deal in terms of scale and visibility for the hobby. 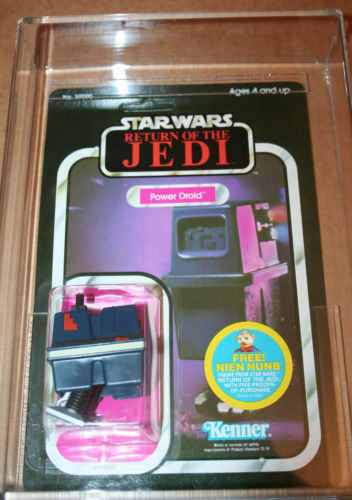 As at the end of the day regardless of details of the transaction it will be perceived as a high point for the hobby and will hopefully lead to other Star Wars items on Toy Hunters over the coming years.